As we round the corner and move towards 2018, do you still have any items on your “to do” list that you wanted to accomplish in 2017? I know I still have a few things on my list which will be pushed into the new year. At the start of the New Year, I enjoy boxing up old files and starting new files for the upcoming year. It is also fun to get a new calendar – another opportunity to start fresh and organize your work and personal life. For many of us, a New Year is a fresh slate and we vow to . . . . . (you fill in the blank). What is important to you? Let’s look at a few items and see if any resonate with you. Perhaps these ideas will help you get started on your goals for 2018. Do you want be healthier? Let’s say that in 2018, you decide to focus on eating healthier or being more active. If you want to eat healthier, start by visiting http://choosemyplate.gov where you will find Super Tracker – an online food, activity and weight management tool that you can customize. Also explore USDA’s What’s Cooking? Mixing Bowl – a site full of tasty recipes and meal planning tools. Still looking for additional ways to cut calories? Check out the tips shared on the Center for Disease Control and Prevention’s (CDC’s) website. An easy jump-start to eating healthier is to fill half of your plate with vegetables and fruits. Perhaps your beverage choices contribute to excess calories. It might be time to Rethink Your Drink. What can you do to reduce calories? Do you want to re-energize and move more? Most of us can make improvements in this area. Set your activity goals and find an activity that moves you. Not sure where to start? Check out the CDC’s physical activity basics for adults. If you have 10 minutes to move then start with those 10. Make it a goal to add another 10 minutes during lunchtime and finish your day with another 10 minutes of activity. You will have added 30 minutes of physical activity to your day in 3 easy chunks! This infographic from the American Heart Association may help you get started on your circuit training activity plan. Create Your Own Circuit Workout. Source: American Heart Association. 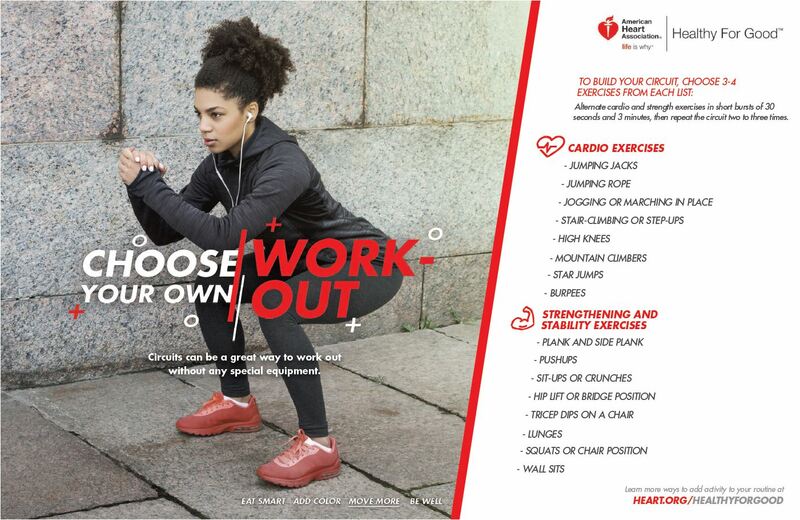 https://healthyforgood.heart.org/move-more/infographics/create-a-circuit-home-workout. Clutter getting you down? Perhaps your goal for 2018 is to de-clutter and simplify your life. University of Illinois Extension has a great website to help you get started. Not sure where to start? Use the Clutter Emergency Card to help you sort what you should toss, keep or give away. Start small in one area, and once it is de-cluttered, move to another area. In the New Year, what challenge will you take on? Share your ideas in the comments!